This book provides an overview of historical and contemporary cases of homicidal poisoning. While homicidal poisoning is sometimes thought of as a thing of the past, it continues to be a contemporary problem, and in fact the unknown offender rate for poisoning cases is 20-30 times that of other homicide types in contemporary research, and many poisoners commit serial homicides while going undetected. The author of this important and timely work explores the theoretical bases for understanding homicidal poisoning, the nature of poisons used in homicidal cases, the characteristics of poisoners and their victims, and techniques for detection and prevention. This unique book will be of particular interest to: students of criminology (classes dealing with criminal psychology, and murder investigation); students of the history of crime; criminal justice professionals: attorneys, homicide detectives, forensic pathologists, forensic and clinical toxicologists, and other forensic investigators; and all interested in poisons, poisoners and the detection of poisoning. It has relevance to criminology, law and policing, toxicology and forensic science, the history of crime and detection, and criminal psychology. "A most welcomed addition to the important subject of the criminal poisoner. The author has done a fantastic job of researching the world literature, and distilling it down for the reader. The work is very well referenced, and provides critical information for law enforcement, forensic pathologists, and others, that could be dealing with the criminal poisoner." "Dr Michael Farrell has produced a comprehensive and authoritative work on a most serious but often overlooked aspect of criminal assault - the act of poisoning. In the Criminology of Homicidal Poisoning, Farrell seamlessly weaves together the facts about poisons and their use as an instrument of homicide with the context of the larger issue of murder. By examining the poisoner and the victim, the reader is provided a depth of understanding about how a deadly outcome arose and why the choice was made to employ poison to get the grisly job done. With criminal homicide by poisoning making up a small percentage of known crimes, the danger of insufficient scholarly attention is present. Dr Michael Farrell makes a significant contribution to ensure against this potential. As a homicide researcher, I know Criminology of Homicidal Poisoning will join the works I turn to in understanding the nuances of the how and why of homicide." "This comprehensive text links forensic toxicology with criminology, making a solid contribution to both fields. 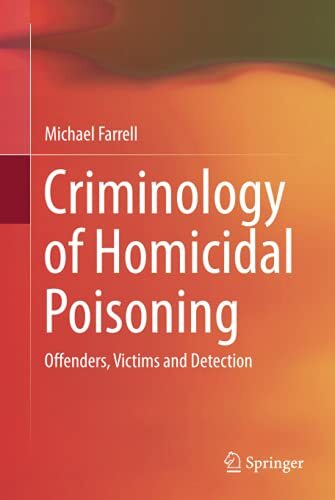 Farrell not only describes how homicidal poisoning fits the most popular criminological theories for why people kill but also examines the nature and lethality of various poisons, identifies trends in poisoning, provides a history, and shows offender traits and victim characteristics. In addition, he discusses issues for investigators and prosecutors who will be taking a poisoning case to trial." Dr. Michael Farrell was educated in the UK. After training as a teacher at Bishop Grosseteste College, Lincoln, and obtaining an honours degree from Nottingham University, he gained a M.A. in Education and Psychology from the Institute of Education, London University. Subsequently, he carried out research for an M.Phil. at the Institute of Psychiatry, London, and for a Ph.D. under the auspices of the Medical Research Council Cognitive Development Unit and London University. Professionally, Michael Farrell held senior posts in schools and units for people with various mental disorders. He managed a UK-wide psychometric project for City University, London and directed a national initial teacher-training project for the UK Government Department of Education. For over a decade, he led teams inspecting mainstream and special schools and units (boarding, day, hospital, psychiatric). Currently, he works as a private consultant with a range of clients and has lectured or provided consultancy services in various countries including China, Japan, the Seychelles, Australia, Peru, Sweden, and the UK. He has broadcast on the BBC World Service and on UK national radio and has written articles on crime and poisoning in a range of medical, police and legal journals. His many books are translated into European and Asian languages.